Just days after George Washington University (GW) School of Medicine and Health Sciences (SMHS) students gathered to express concerns about gun violence and patient safety, two more shootings occurred: One in Wisconsin and one in Pennsylvania. The next day, another shooting occurred, this time in Maryland. And those were just the incidents reported in the national news. In less than nine months in 2018, more than 10,500 deaths have been attributed to gun violence, according to nonprofit Gun Violence Archive. 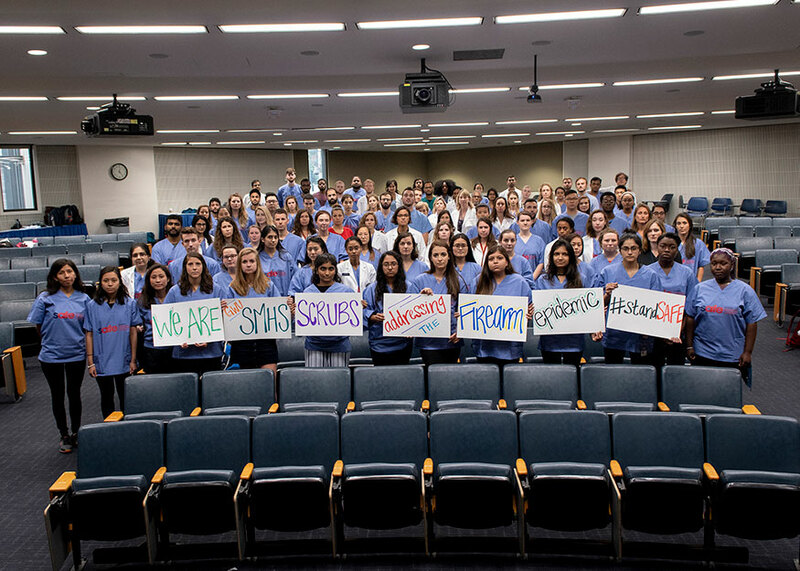 To address the growing danger gun violence poses to their patients, medical students and practitioners nationwide are taking part in a new coalition called Scrubs Addressing the Firearm Epidemic, or SAFE. More than three dozen medical institutions have established a SAFE chapter, including SMHS, which held its first event and information session on Sept. 17. SMHS Social Justice Interest Group (SJIG) co-leaders Kime McClintock and Charles Hartley, second-year MD students, were trying to create an agenda for this year when they learned about SAFE. The students wanted to focus on causes that would allow them to work with other groups on campus, and with causes that were timely and important. In addition to the SAFE campaign, the group also will be starting outreach with the Social Medicine Consortium’s Campaign Against Racism. Twenty to 30 years ago, clinicians focused more on the patient in front of them than on the social determinants of disease, added Howard Straker, PA-C, MPH, assistant professor of physician assistant studies at SMHS, but social determinants play an important role in health, and for students, it’s important to learn about those early on. “It’s easier for them to learn it all together. And in a lot of ways students have had an impact on changing curriculum over the years, so I think one possible outcome [of SAFE] is for us as faculty to think ‘How do we teach this? What are the ways to help clinicians ask patients about firearms and counsel them in a way that is productive?” he said. Hartley added that in today’s world, it can be challenging to have a grasp on every issue, and to choose which of the many fires burning to focus on. SJIG wants to make it simpler for students to be part of something larger than themselves. SAFE is focused on addressing the gun violence epidemic in a nonpartisan way, through research, education, and evidence-based policy, added Hartley. “We want to take something that can be very divisive, but touches all of us, and put aside political disagreements and look at the ways that have been proven for how this issue can be handled,” he said. Both McClintock and Hartley are determined to provide their SMHS classmates with hands-on training and tangible skills that they can implement while in medical school and in future practice. That includes working with other SMHS groups, such as the Emergency Medicine Interest Group, to hold workshops on assessing gunshot wound victims in a trauma setting. According to Hartley, SAFE hopes to have other activities in the coming weeks. In particular, due to the prevalence of suicides using a firearm, SJIG will partner with the students organizing Suicide Prevention Week to highlight the importance of preventative interventions. “We want to educate people about that risk and make sure anyone who is at risk for depression or for self-harm, that an intervention is being done and done in an effective way,” he said. The group also plans to work with educators in the GW Hospital Center for Trauma and Critical Care who can teach students about language involving gun ownership and gun safety. “We want to make sure that we as practitioners have the vocabulary necessary to make sure patients who own firearms understand that we know what we’re talking about and that what we’re saying about safety is something that comes with credence,” Hartley said. Research is also a leg of SAFE’s mission, and Hartley says SIJG is looking for ways to help students find and participate in gun violence research initiatives taking place in Washington, D.C. “We want to coordinate with researchers here at GW, at Children’s National Health System, at Washington Trauma Center, and other medical schools in the area to make sure researchers and students interested in research have a place where they [can connect],” he said. Both Hartley and McClintock want to leave a lasting mark, and ensure there are students who will continue with these efforts. “I hope we’re make a space where people can bring their own personal passions, and also a community where people can come together and care about a variety of issues and build comradery, so it will keep going,” said McClintock.